Daniel H. Hanshaw2,7,8 [Harrison Henshaw9, H. Perry Hanshew10, Harrald P. Hanshew11]. Hanshaw, Dan'l H., age 30, born in Virginia; parents born in Virginia; first marriage, married 1 year; occupation: brakeman, railroad; rented home. Hanshaw, Pearl, wife, age 21, born in Virginia; father born in England; mother born in Virginia; first marriage, married 1 year; 1 child, 1 living. Hanshaw, Raymond, son, age 5 months, born in Ohio; parents born in Virginia. On Wednesday, May 18 1910, Daniel suffered an accident while working as a railroad brakeman; his foot was crushed and needed to be amputated.15 On Monday, September 6 1910, Daniel was again injured in another train accident, along with his brother G.T. Hanshaw.16 See newspaper scans below. Pearl died Sep 2 1914, at the home of sister-in-law Ollie Jennings, 1745 11th St., Portsmouth, Scioto County, Ohio.17 Pearl committed suicide by drinking two bottles of carbolic acid17 (see newspaper scan below). Hanshaw, Daniel H., employee, age 36, born in Virginia; parents born in Virginia; occupation: attendant. Suicide of Pearl Hanshaw; "Portsmouth Daily Times", Sep 2 1914. 1910 census, 4th Ward, Portsmouth, Scioto County, Ohio; roll T624-1228, ED 156, page 21A, line #4, dwelling #102, family #107. Raymond Anderson Hanshaw death record. California, Death Index, 1940-1997; http://www.ancestry.com. Arthur J. Hanshaw birth record. 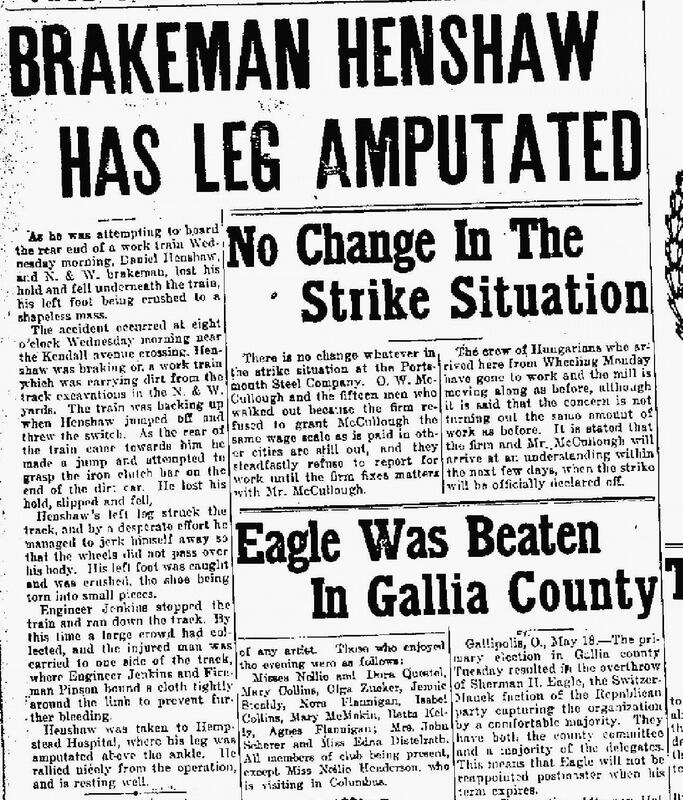 "Portsmouth Daily Times" (Portsmouth, Ohio), Jul 7 1921; http://www.ancestry.com. 1920 census, Columbus, Franklin County, Ohio; roll T625-1383, ED 186, page 1B, line #55. 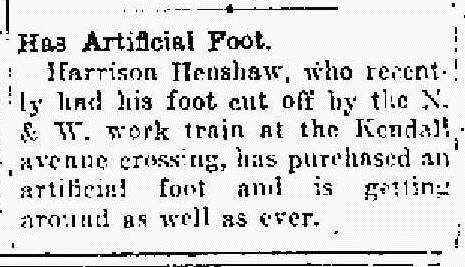 "Portsmouth Daily Times" (Portsmouth, Ohio), Sep 20 1910; http://www.ancestry.com. 1880 census, Tazewell County, Virginia; ED 89, page 262d/16, line #17, dwelling #137, family #144. 1900 census, Graham Town, Clear Fork District, Tazewell County, Virginia; roll T623-1730, ED 93, page 12B, line #62, dwelling #211, family #238. Ancestry Family Tree data "Cantrell Family Tree" posted by "KevinCantrell93". Raymond Anderson Hanshaw birth record. "Portsmouth Daily Times" (Portsmouth, Ohio), May 18 1910; http://www.ancestry.com. "Portsmouth Daily Times" (Portsmouth, Ohio), Sep 6 1910; http://www.ancestry.com. "Portsmouth Daily Times" (Portsmouth, Ohio), Sep 2 1914; http://www.ancestry.com.